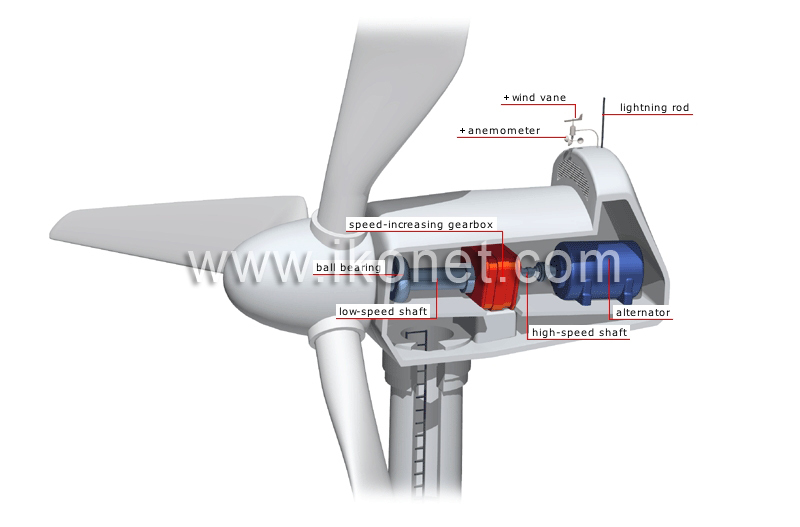 Metal rod that is attached to the nacelle; it protects the wind turbine from lightning, which it directs toward the ground. Rotating machine that is driven by the high-speed shaft; it converts mechanical energy into electric energy and then directs it to the transmission network. Cylindrical piece that transmits the high-speed movement of the rotor to the alternator; it turns at about 1,500 rpm. Part that increases the rotational speed of the rotor to drive the alternator. Cylindrical part that transmits the rotor hub’s movement to the gearbox; the low-speed shaft usually turns at 20 or 30 rpm. Instrument that measures wind speed using cups that rotate around a mobile shaft at varying speeds. Part that consists of steel rings with steel balls inserted between them; it reduces friction as the shaft rotates.